I think this card stands as an important example of the kind of thing Wizards is willing to do with the new model of Core Set. In a way it reminds me of Hive Mind from M10-- an enchantment with a big, splashy effect that shakes up the game state and has the potential to generate some fun moments, that might have been harder to print in an expansion set due to the need to maintain the flavor of the plane the expansion takes place on. And like Hive Mind, Wild Evocation won't go in everybody's deck, and not just because you need red mana to cast it. It's a big, exciting effect, but it's also a random effect. And it's symmetrical. And, like Howling Mine, your opponent gets to benefit before you do. One of the biggest complaints about Howling Mine was that your opponent could pick up his extra card and then Shatter the Mine. Well, with Wild Evocation, your opponent gets a random card in his hand out for free, then can Naturalize the Evocation. This is true, but it also depends on your opponent having the kill spell in hand that turn, and unlike Howling Mine, WIld Evocation can't give your opoonent (or you) anything that isn't already in the player's hand. But what it can do is give a player a free spell, regardless of whether or not said player has the mana for it. As far as abusing Wild Evocation goes, the obvious solutions are twofold: empty your opponent's hand, or make sure your hand contains game-ending spells that you don't expect to be able to cast normally. Emptying your opponent's hand is the simpler solution. Just play a B/R discard deck with plenty of ways to strip your opponent's hand, then drop the Evocation and get a free spell each turn, while your opponent has no cards in hand to reveal to the Evocation. The problem with this plan is that if your deck contains discard spells like Inquisition of Kozilek, Perish the Thought, or Mind Rot, then you're likely to draw said cards even after the Evocation hits play, and thus the Evocation runs the risk of giving you spells that are useless, because you're targeting a player with an empty hand. Of course, having an opponent stuck in topdeck mode isn't a bad thing, but at this point Wild Evocation has become six mana to do very little beyond drop a few extra lands into play, maybe. The other solution, to pack your hand with bombs and use the Evocation to cheat them out, must contend with the fact that you reveal cards to play off the Evocation randomly. If you've cast the Evocation, you likely have six mana, and in theory should be able to dump your hand of everything that isn't Emrakul, the Aeons Torn or of similar caliber. However, you also have to have your trump card in your hand, which means drawing it. I suspect the rest of your deck would need to be draw spells then--preferably spells like Ponder, Sift, See Beyond, and the like, allowing you to dig for what you want without having to hold onto what you don't need. But then the same problem arises as in Solution One-- once the Evocation hits the table, unless your deck contains twenty or more Emrakuls and Cruel Ultimatums and the like, statistically the Evocation will be freecasting your draw spells. Which will of course draw you more cards, making your bomb cards even less likely to come up on the roulette wheel next turn. Meanwhile, what is your opponent doing? Really, the best use of this card is in multiplayer. Any card that affects all players usually is. And in multiplayer, you have the fortunate side benefit that if other players think that the free card they get each turn is more advantageous to them than it is to the other players, they may choose not to attack you, or even defend you from other players. Also, the randomness will create more fun, unexpected situations when there's multple players being affected by them. Head-to-head battle of mages' wills over the top of the battlefield? Check. Chance-based implementation? Check. Massive back-and-forth shifts over several turns? Check. Yes, red is doing what it does best in M11. 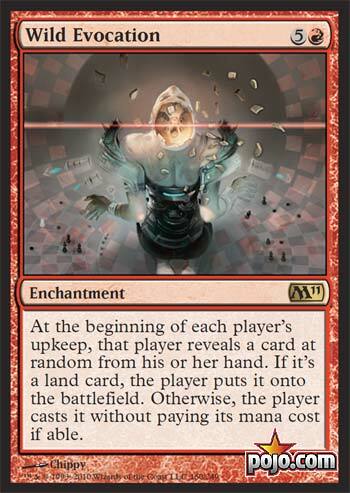 In addition, this card gives every color a way to get Eldrazi into play without paying full price for them, which you can be sure was not an accident. I'm looking forward to seeing what sort of crazy Wild Evocation decks people come up with in a couple of weeks - just keep the transformative sideboard handy, as I'm not sure you can count on other Wild Evocation decks having (or not having!) all the same legendary creatures as you do! Readers do you see the artwork on this card? That's my face after I read it. My Johnny senses are going off the charts. In standard this card is crap barring some sort of Hivemind insane combination, same for extended. In casual and multiplayer this card is a godsend for players to build a deck around speaking of which in my column Paul's perspective I built a deck revolving around this card. Its a symmetrical effect that can accelerate players land or allow players to replay powerful spells. In limited its jank. There isn't a lot to say about this card either its a multiplayer oddity or the potential lynchpin an absurd combo deck only time will tell. enchantment already costs a relatively high six mana. new card in 2011 that makes this good.